A comprehensive PDF tutorial using the pre-installed Windows Movie Maker software in Microsoft’s Windows 7 operating system. 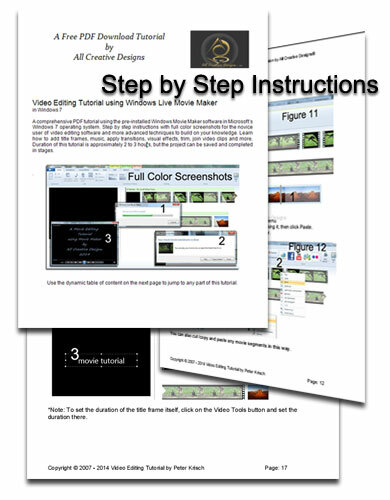 Practical instructions presented in a step by step sequence with 27 full color screen shots. This tutorial is suitable for the beginner to video editing software and as a reference resource for the more advanced user, explaining techniques to build on your knowledge. Learn how to add title frames, credits, music, apply transitions, visual effects, trim, join video clips and more. Duration of this tutorial is approximately 2 to 3 hrs, but the project can be saved and completed in stages. Movie Maker is a basic but very capable video editor providing a multitude of functions to create your own individual video clips. Use Windows Live Movie Maker to convert large file size AV format videos to a compact Windows Media Audio/video file, which can be saved in different resolutions and attached to your emails or uploaded to social networking sites, such a Facebook or YouTube. Movie Maker will also efficiently import video footage from your devices.